In this session, Ben Bromhead, CTO of Instaclustr will provide a base level introduction to some of the technologies and design patterns used to build out scalable and resilient applications. • When you should use these technologies and key considerations. • Different architecture options when combining these leading open source technologies. • How to use the technologies in a resilient and scalable way and real-world application patterns such as IoT, social apps and consumer services. Introducing the Instaclustr Open Source Certification Framework and Certified Apache Cassandra. Learn about Instaclustr's new Open Source Certification Framework and first certified product, Apache Cassandra. The certification framework aims to build on Instaclustr’s extensive open source experience to provide additional assurance to companies that the open source software they are building on is robust and well supported. This webinar will explain the details of the framework and the certification process for Apache Cassandra. Bio: Ben Slater, Chief Product Officer at Instaclustr. As Chief Product Officer, Ben is charged with steering Instaclustr’s development roadmap and overseeing the product engineering, production support, open source and consulting teams. Ben has over 20 years experience in systems development including previously as lead architect for the product that is now Oracle Policy Automation and over 10 years as a solution architect and project manager for Accenture. He has extensive experience in managing development teams and implementing quality controlled engineering practices. As distributed applications grow more complex, dynamic, and massively scalable, “observability” becomes more critical. Observability is the practice of using metrics, monitoring and distributed tracing to understand how a system works. In this webinar we’ll explore two complementary Open Source technologies: Prometheus for monitoring application metrics; and OpenTracing and Jaeger for distributed tracing. We’ll discover how they improve the observability of an Anomaly Detection system - an application which is built around Instaclustr managed Apache Cassandra and Apache Kafka clusters, and dynamically deployed and scaled on Kubernetes (on AWS EKS). 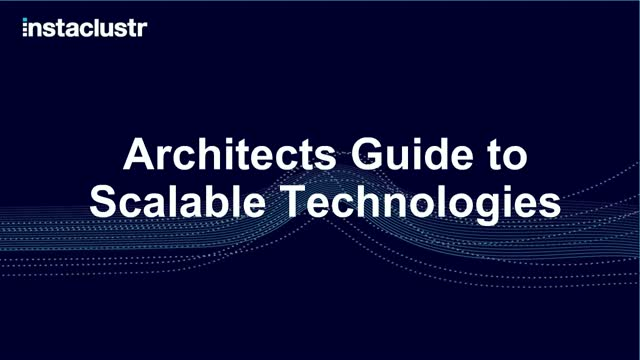 We will cover when you should use these technologies and key considerations when choosing these technologies for your application architecture. In addition, we will touch on different architecture options when combining these leading open source technologies into an overall solution. We will also discuss how to use the technologies in a resilient and scalable way and real-world application patterns such as IoT, social apps and consumer services. Instaclustr recently extended their managed service for Apache Cassandra to include support for Apache Kafka, this presentation will walk through the key challenges and lessons learned in extending Instaclustr’s provisioning and management system for Kafka. Specific details will include: benchmarking, choosing appropriate cloud provider configurations, and security configuration. Instaclustr provides Apache Cassandra, Apache Kafka and Apache Spark as a managed service. This presentation will work through integrating these technologies with a Kubernetes-deployed business logic layer to produce a massively scaleable application. Using anomaly detection as a illustrative use case we will work through topics including: the benefits of using Kafka as a buffer; design of Kafka and Cassandra client applications for scaleability, deployment automation and benchmarking results. Instaclustr’s Managed Platform simplifies and accelerates the delivery of reliability at scale through open source solutions. By providing Apache Cassandra, Apache Kafka, Elasticsearch, Apache Spark and other leading open source technologies through single environment, Instaclustr make it easy to deliver applications at any scale and, most importantly, operate them at the highest levels of reliability. Instaclustr provides the benefits of open source without the risk and costs of learning to manage it yourself. - provide insight into Instaclustr’s product roadmap for future enhancements. -What topics should I create? -How many partitions should I have in each topic? -Should I use a message key? If so, how do I choose an appropriate value? Instaclustr has recently extended its managed service for Apache Cassandra, Apache Spark and Elassandra to include support for Apache Kafka. This webinar will walk through the key features and benefits of Instaclustr’s Managed Kafka. Discover how Instaclustr have applied our over 20 million node-hours of experience running distributed systems to deliver the most reliable Kafka managed service available. Kubernetes has become the most popular container orchestration and management API with cloud-native support from AWS, GCP, Azure and a growing enterprise support ecosystem. Leveraging Kubernetes to provide tested, repeatable deployment patterns that follow best practices is a win for both developers and operators. In this talk Ben Bromhead, CTO of Instaclustr will introduce the Cassandra Kubernetes Operator, a Cassandra controller that provides robust, managed Cassandra deployments on Kubernetes. By adopting Kubernetes and Cassandra, you can provide DBaaS like services rapidly and easily to the rest of your team and have a simple on-ramp to true multi-cloud capabilities to your environment. Competing globally means processing billions of mobile, online and in-store transactions while meeting Payment Services Directive (PSD2). In the financial services market the demand to support hundreds of thousands of merchants in over a hundred currencies and providing transaction history for customers dating back seven or more years, requires a data platform and cloud services that will support scalable agility and flexibility. In this webinar, presented by AWS and Instaclustr, we will discuss how to utilize AWS and Open Source Solutions to keep up with the competitive demands of the industry. Reserve your spot in this interactive, 30-minute console demo with expert Q&A from our Chief Product Officer, Ben Slater. In this presentation we will survey the functionality of Instaclustr’s core offerings - Managed Apache Cassandra, Apache Spark, Elassandra and Apache Kafka and walk through uses of these technologies in real-world application patterns such as IOT, social apps and consumer services. We will touch on key considerations when choosing these technologies for your application architecture and different architecture options when combining these leading open source technologies into an overall solution. This webinar series will focus on a few of the key benefits of open source software for enterprise. Adoption of open source software (OSS) at the enterprise level has flourished, as more businesses discover the considerable advantages that open source solutions hold over their proprietary counterparts, and as the enterprise mentality around open source continues to shift. With over 10 million node hours and a petabyte of data under management globally for a wide range of clients, Instaclustr has seen it all. Instaclustr has recently partnered with Kinetic Data to provide support through our Managed Service. Kinetic Data provides a powerful platform to build enterprise applications without expensive development and support costs. This solution extends the value of leveraging Cassandra for an enterprise software platform. John Sundberg of Kinetic Data, the creator of Kinetic Request and Kinetic Task, and Ben Bromhead, CTO and Co-Founder of Instaclustr, will walk through the benefits of a low-code platform built on Cassandra. This webinar will also discuss the modern business approach to open source and enterprise software deployment and the pitfalls associated with technology lock in. Instaclustr, the Open Source-as-a-Service company, has recently released Elassandra and Kibana support through our Managed Service. Elassandra gives you the power of Elasticsearch to search your data directly from Cassandra – without developing custom integration or synchronisation code. This secondary index also provides the availability and cross-region replication benefits of Cassandra. In this 30 minute webinar, Vincent Royer of Strapdata, the creator of Elassandra, and Instaclustr will walk you through the basic architecture and features of Elassandra and Instaclustr’s managed service offering for Elassandra and Kibana. This webinar provides a detailed comparison between open source Apache Cassandra managed by Instaclustr and proprietary technologies such as DataStax Enterprise. The aim is to highlight the operational and cost benefits associated with deploying open source Apache Cassandra and other data management technologies including Apache Spark. This webinar will also discuss the modern business approach to open source and enterprise software deployment and the pitfalls associated with technology lock in. With almost 10 million node hours of operational experience running Cassandra, and currently managing and supporting hundreds of clusters and thousands of nodes globally for a diverse range of clients, Instaclustr has seen it all. Our live 45 minute webinar will walk you through the steps for responding to high severity incidents in unknown environments. Our 45 minute live webinar will provide you with vital tips and "lessons learned" to ensure your cluster runs smoothly. -The most common operational problems in Cassandra, and how to solve them. Instaclustr delivers reliability at scale through our integrated data platform of open source technologies such as Apache Cassandra, Apache Kafka, Apache Spark and Elasticsearch. Our expertize stems from delivering more than 25+ million node hours under management, allowing us to run the world’s most powerful data technologies effortlessly. We provide a range of managed, consulting and support services to help our customers develop and deploy solutions around open source technologies. Our integrated data platform, built on open source technologies, powers mission critical, highly available applications for our customers and help them achieve scalability, reliability and performance for their applications.